Wind-driven flames move across Malibu Creek State Park during the Woolsey Fire on November 9, 2018 near Malibu, California. 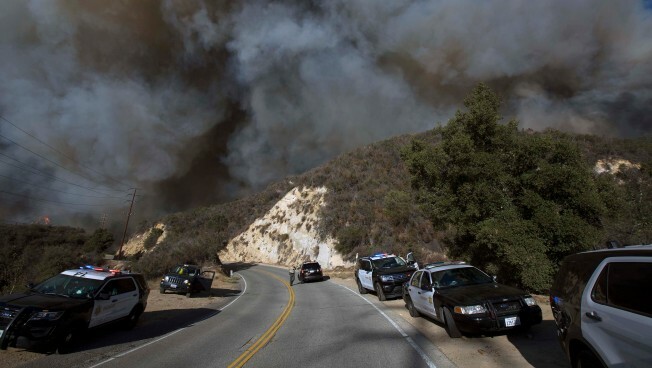 The skeletal remains of a person were found along Latigo Canyon Road after the Woolsey Fire burned brush and trees that may have concealed the body for many months. The Los Angeles County Coroner’s Office described the remains Tuesday as “bone fragments” and said an autopsy was pending and no identification had been made. "A property owner was surveying the damage to their property when they came across the remains," the LA County Sheriff’s Department said. "It was confirmed the remains had been there prior to the recent fires in the Malibu area." Last week, the Sheriff’s Department said it found a body at a home in the 32000 block of Lobo Canyon Road in Agoura Hills after family members requested deputies check the residence. "They hadn't heard from the resident," said Sheriff Jim McDonnell, adding that the resident appeared to live alone at the house. Details about a cause of death were not immediately available but the Department said the death appears to be related to the 97,600-acre Woolsey Fire. The Coroner’s Office said an autopsy was pending and no identification had been confirmed. Last week, the LA County Sheriff’s Department said it found a body at a home in the 32000 block of Lobo Canyon Road in Agoura Hills after family members requested deputies check the residence. The remains were located in debris on the property in the path of the fast-moving wildfire. Aerial video showed blackened hillsides, burned vehicles at at least two destroyed residences in the canyon area northwest of Los Angeles. Days earlier, the remains of two other people were found inside a burned vehicle along a driveway in the 33000 block of Mulholland Highway. One of the two died from “the effects of thermal injuries,” the Coroner said. Identifications had not been confirmed. As of Tuesday morning officials said the Woolsey Fire had burned nearly 97,000 acres and was 96-percent contained. At least 1500 buildings were destroyed and hundreds more were damaged, according to Cal-Fire.